HESS - Can mussels be used as sentinel organisms for characterization of pollution in urban water systems? Can mussels be used as sentinel organisms for characterization of pollution in urban water systems? Abstract. Urbanization strongly impacts aquatic ecosystems by decreasing water quality and altering water cycles. Today, much effort is put towards the restoration and conservation of urban waterbodies to enhance ecosystem service provision, leading to liveable and sustainable cities. To enable a sustainable management of waterbodies, the quantification of the temporal and spatial variability of pollution levels and biogeochemical processes is essential. 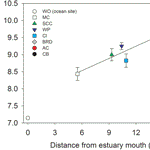 Stable isotopes have widely been used to identify sources of pollution in ecosystems. For example, increased nitrogen levels in waterbodies are often accompanied with a higher nitrogen stable isotope signature (δ15N), which can then be detected in higher trophic levels such as mussels. 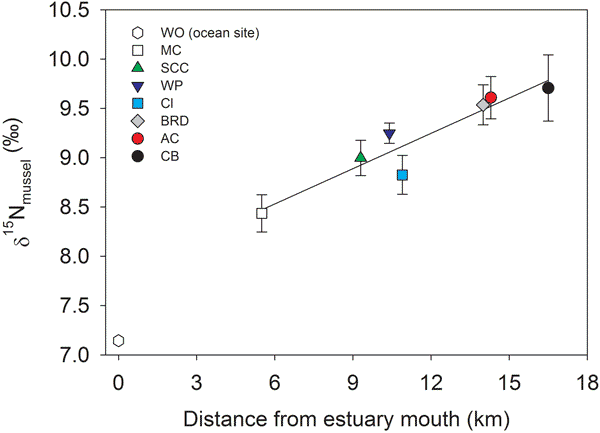 The main aim of this study was to assess the suitability of nitrogen stable isotopes as measured in mussels (Mytilus edulis), as an indicator able to resolve spatial and temporal variability of nitrogen pollution in an urban, tidally influenced estuary (Swan River estuary in Western Australia). Nitrogen concentrations were generally low and nitrogen stable isotope values of nitrate throughout the estuary were well within natural values of uncontaminated groundwater, organic nitrate from soils, or marine-derived sources, indicating groundwater inflow rather than pollution by human activity was responsible for differences between sites. The δ15N signature in mussels was very stable over time within each site which indicated that mussels can be used as time-integrated sentinel organisms in urban systems. In addition, our study shows that the nature of the relationship between δ15N in the mussels and the nitrate in the water can provide insights into site-specific biogeochemical transformation of nutrients. We suggest that mussels and other sentinel organisms can become a robust tool for the detection and characterization of the dynamics of a number of emerging anthropogenic pollutants of concern in urban water systems. How to cite: Reichwaldt, E. S. and Ghadouani, A.: Can mussels be used as sentinel organisms for characterization of pollution in urban water systems?, Hydrol. Earth Syst. Sci., 20, 2679-2689, https://doi.org/10.5194/hess-20-2679-2016, 2016. We assessed if nitrogen stable isotopes in mussels are a suitable indicator, capable of resolving spatial and temporal variability of nutrient pollution in an urban estuary. Our results highlight the value of using stable isotope analysis as an integrative tool to establish an understanding of local processes and pollution levels in theses urban aquatic systems. We suggest that mussels can become a robust tool for the detection of emerging anthropogenic pollutants of concern in urban water systems.